Strangely enough, this is my first lemon post. I absolutely love lemons in baked goods. Lemon desserts don’t weigh you down and make you feel like you loaded yourself with sugar. They are refreshing with their sweet and sour tastes. Oh how I love them. 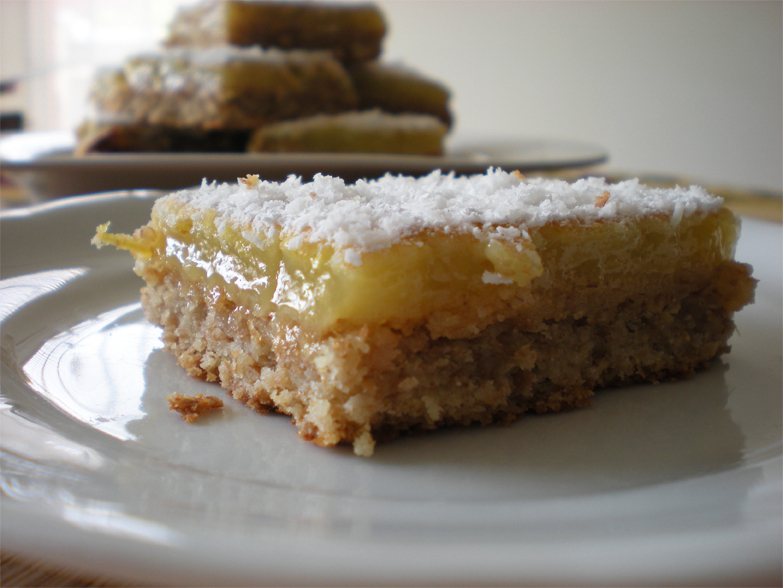 Lemon bars are a must for me because I garnish them with coconut. Lemon and coconut has to be one of the greatest combinations ever, and that’s not only because I’m also addicted to coconut. I will be making all my favorite lemon desserts for the blog in the near future, I promise. 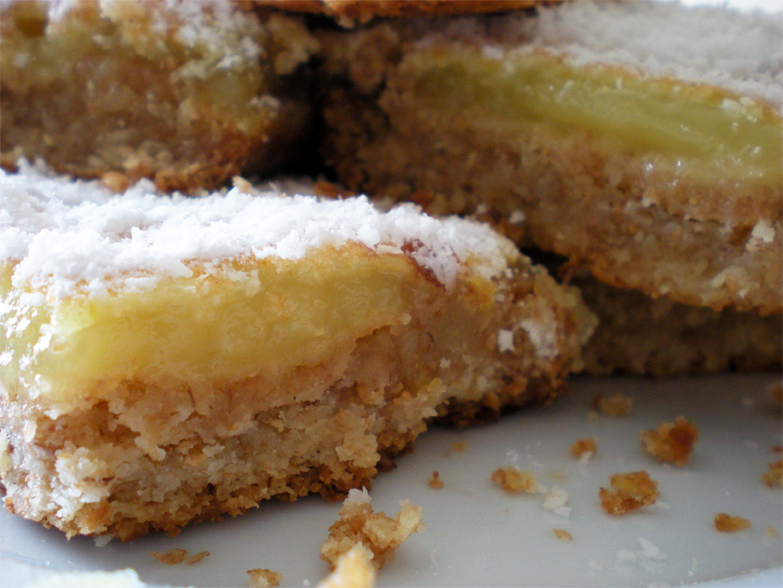 The recipe that I use for these little bars of tangy heaven, is Stephanie’s from The Joy of Baking. I did tweak a couple of things. I used less sugar, and I used whole wheat flour in the crust, plus I added coconut. I will state changes below. Next add in 1 cup of whole wheat flour and mix with a fork until you get a crumbly but soft dough. * I find using whole wheat flour in the crust contrasts beautifully with the lemon filling, by adding richness in flavor and a bit more crunch to the crust. Also, it’s healthier! Next, oil an 8 x 8 inch pan. I also like to line it with parchment paper because these bars are crumbly, and this ensures they will come out easier. Now take the shortbread dough and with a spoon press it down into the pan, making sure to level it out. Put it to bake at 350˚F for about 15- 20 minutes, until its lightly golden brown. For the filling: In another medium sized bowl, take 3/4 cup granulated sugar and 2 eggs and beat with a hand mixer until smooth. Zest 2 lemons, until you have 2 tablespoons of zest. 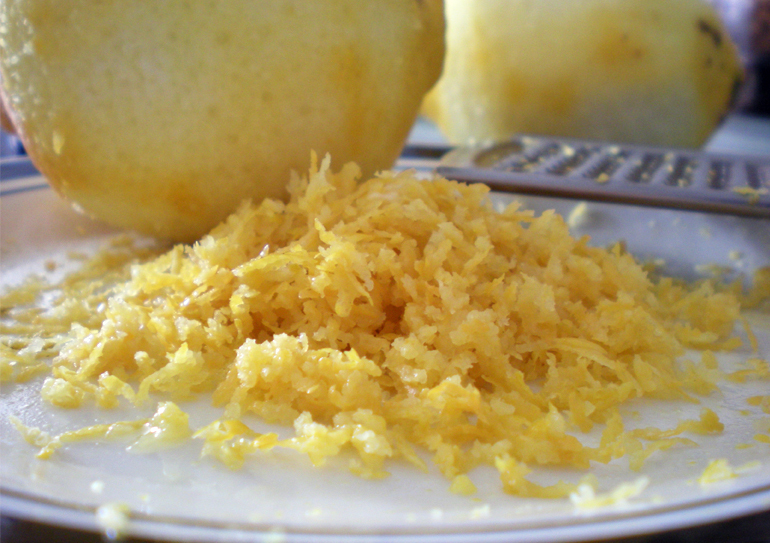 The original recipe calls for only one tablespoon, but I love my zest! Next, juice the lemons until you have 3/4 of a cup of juice. 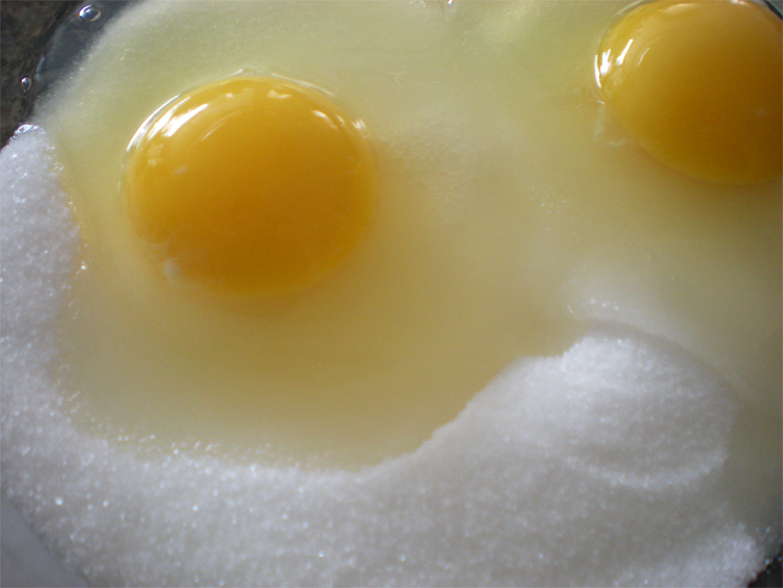 Add the zest and the juice to the sugar and egg mixture and mix until combined. 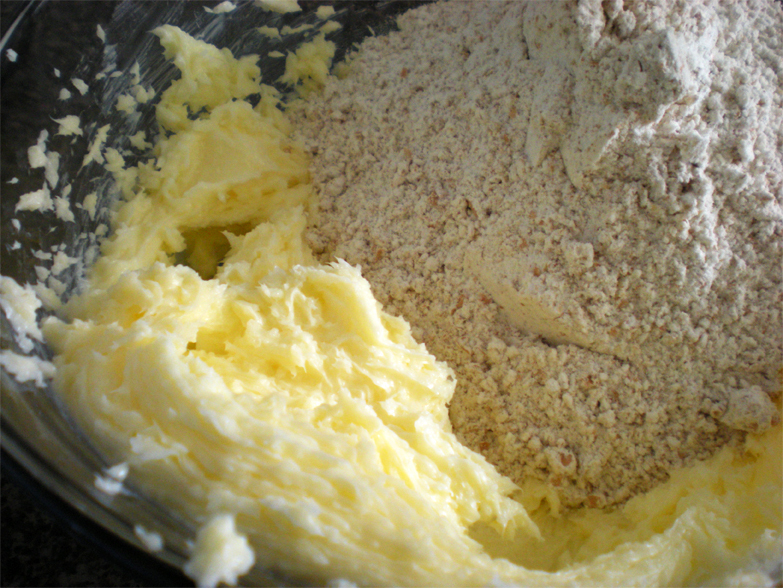 Next, sift in 2 tablespoons of flour and fold it in until combined. Now, pour in the lemon filling onto the shortbread crust. Place back into the oven and bake at 350˚F for about 15 minutes, or until the filling has set and is golden brown. To check, gently shake the pan to see if the filling jiggles. If it does, its not set yet. Make sure you take it out just after it sets, so the filling will be nice and gooey. 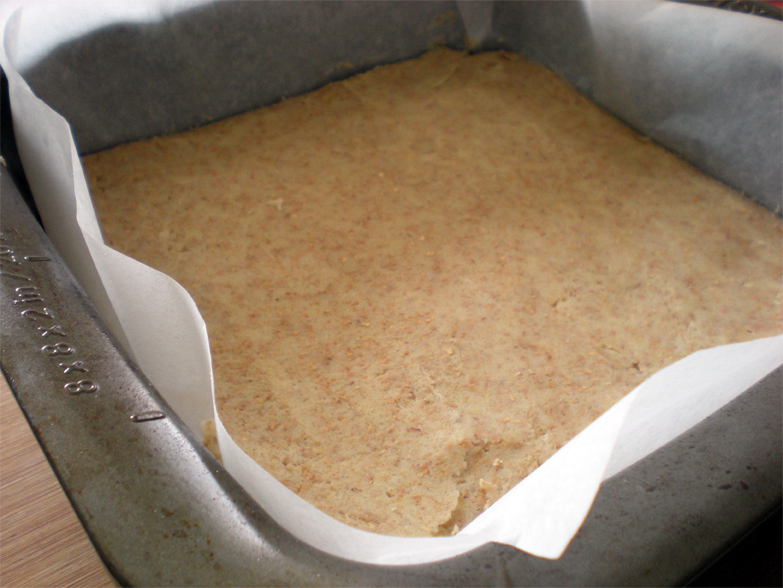 After baking, if you have placed it in parchment paper, let it cool for about 5 minutes then remove it from the pan. 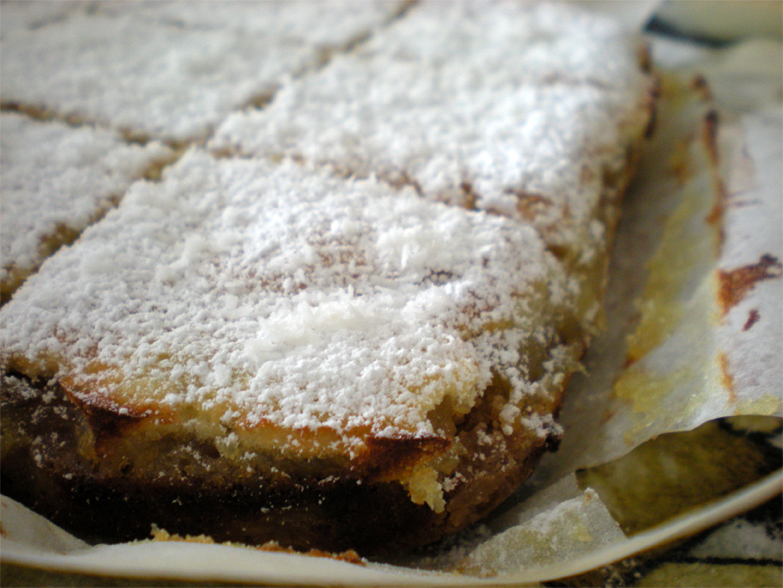 Sift some icing sugar on top and sprinkle with the shredded coconut. Let it cool for another 10 minutes and then cut it. I cut it into 9 big pieces, but you can cut it smaller if you wish. Crunchy, buttery shortbread crust. 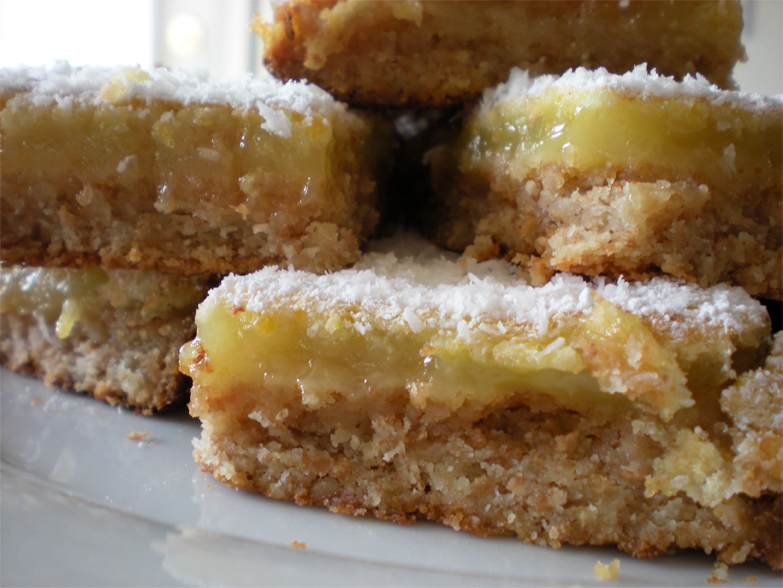 Gooey, tangy-sweet lemon filling covered in just the right amount of icing sugar and lots of coconut… To die for. I bet you wont be able to keep your hands off of these. I sure couldn’t. They were gone the first day! 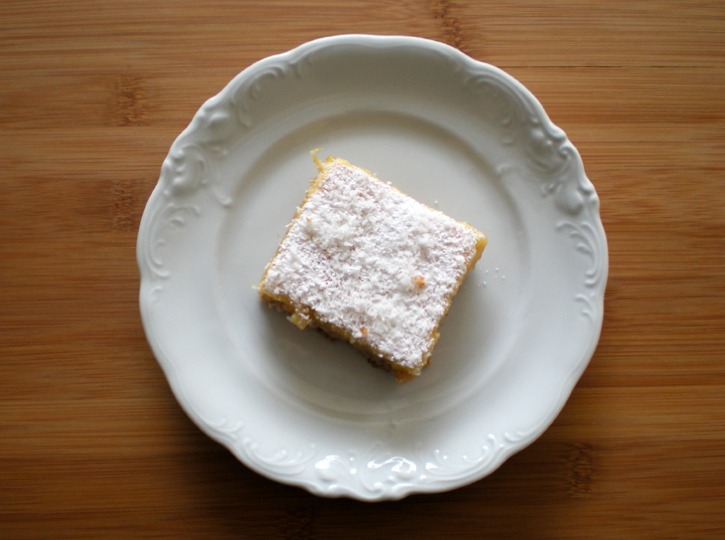 I made these Lemon Bars on the weekend and they were incredibly delicious and easy to do. I used plain flour because I didn’t have wholemeal, and cinnamon instead of coconut for the garnish. It was buttery and sensational and I want to make more so I can eat more! I also got to use some of the many lemons we have at the moment which was great :) Thanks Goodie Plate! 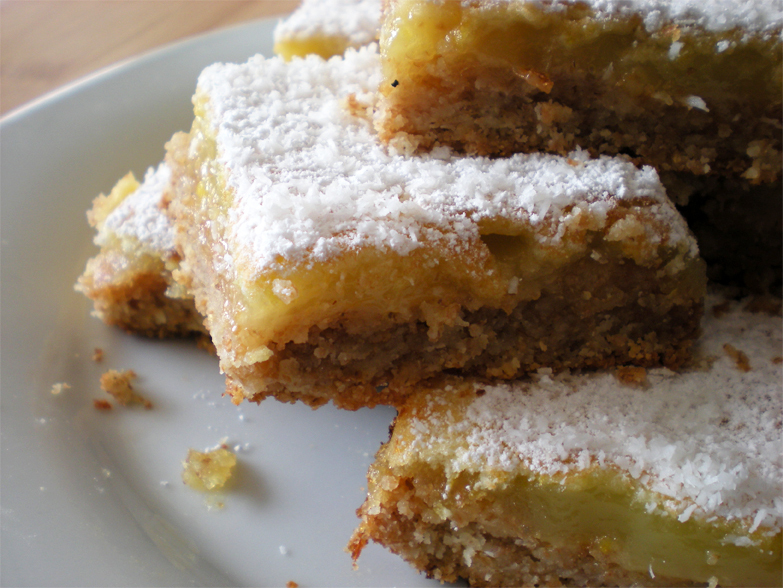 I’ve been searching for a great lemon bar recipe and your’s looks delicious. Love the photos. Also, thanks for checking out my new blog, bmoreenergy. I added you to my blogroll. 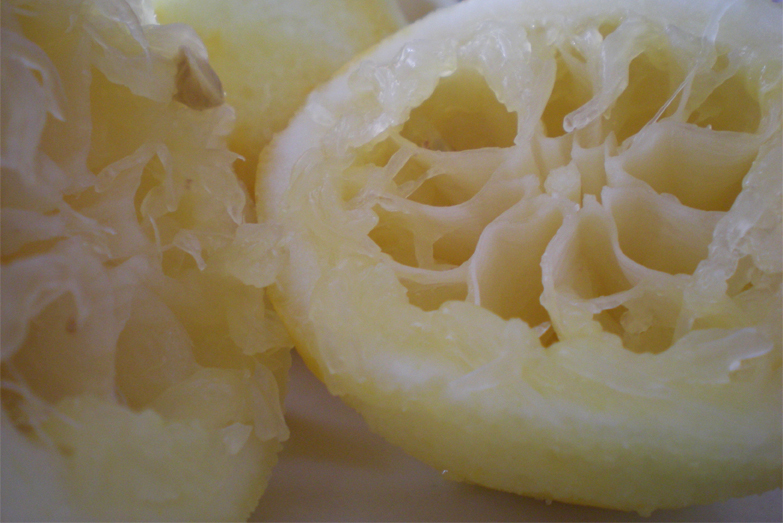 I’m going to make these this weekend, been thinkign what to do with all our lemons…thanks!! Yum!!! Just need a gluten-free version…. you think spelt flour would substitute well instead of whole-wheat flour? I love lemon flavoured desserts (although probably not as much as the Husband does). They’re so light, tart and fresh tasting. I like that you used whole wheat in the crust and reduced the sugar (it makes me feel like these are “health bars”). Yum!